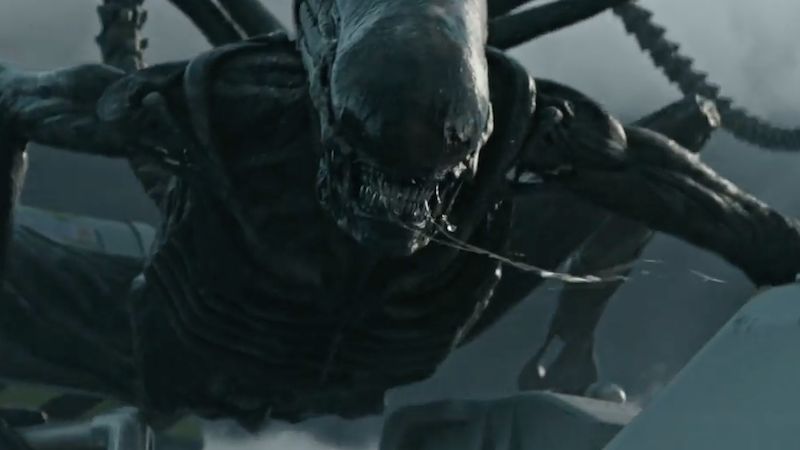 Yesterday, we got a brand new trailer for Alien: Covenant. And today we’re piecing together all the clues we’ve gotten about this movie into one big breakdown. We do it so you don’t have to go crazy. Some of this footage we saw in the first trailer, but with the prologue and everything else released since then, we have a much better idea of what we’re seeing. So, we’re going to do a giant breakdown of everything we now know. It opens with a shot of the crew of the Covenant, a colony ship full of people in cryogenic sleep. Star Katherine Waterston revealed a while back that the crew all consists of couples. From the prologue, even though we still don’t know names, we can suss out a few of the couples: Danny McBride (Tennessee) is married to Amy Seimetz (Faris), Carmen Ejogo appears to be with Billy Crudup, Demián Bichir and Nathaniel Dean are a couple, Jussie Smollet and Tess Haubrich are paired, and we’d already heard that Waterston’s Daniels and James Franco’s Branson are together. Daniels says, “You’ve all sacrificed so much to be here, and be a part of this thing we’re doing.” From the prologue, we know this is from the speech Daniels makes as the mission gets underway. It’s spliced in with a bit that isn’t in the prologue, where Daniels tells us that “this mission is made up of couples,” and then it’s back the speech shown in the prologue. There’s also shot of Walter, one of two androids Michael Fassbender will be playing in this movie. There’s also beautiful shot of the Covenant arriving at what looks like a perfectly fine planet to colonize, followed by a shot of a shuttle landing on the alien planet. We’ve also got a reaction shot from what I’m guessing is Walter showcasing a truly amazing hat. The thing about this whole movie is that what’s scary in the trailer, and the movie, isn’t the unknown. It’s the fact that we all know this is going to go very bad and we know pretty much in what way it will go bad: body horror aliens. So it’s knowing that the hopeful mission, the fact that people have their loved ones with them, and the camaraderie we see with the crew are all doomed that’s being preyed on. And here the landing party makes the classic horror movie mistake of splitting up. We see in the shot of Walter that there are a number of Covenant crew members on the shuttle. Four go off into the grass. Faris, alone, waves them off with a rover with a solar panel. This alien planet that looks untouched by human hands is growing recognizable wheat, which very much has been touched by human hands. This plays into the Alien mythos that there was a race of “Engineers” that were the progenitors of humans—they’re similar to us, why wouldn’t their food be similar? And if they were traveling around, why wouldn’t they carry seeds like we do? The Covenant crew asks, “What are the odds of finding human vegetation this far from Earth?” and “Who planted it?” which are very good questions. Looking around, a person I think is Billy Crudup steps on some round things, releasing spores. It’s like the mist we know is generated when an egg is disturbed. And we’ve seen footage that shows that at least one member of this landing party gets infected with a spineburster. In fact, we saw something go in an ear in the first trailer. Daniels notes that this planet filled with verdant planet life is dead silent, no chirping birds or animal noises. Which is a good sign that something is very wrong. 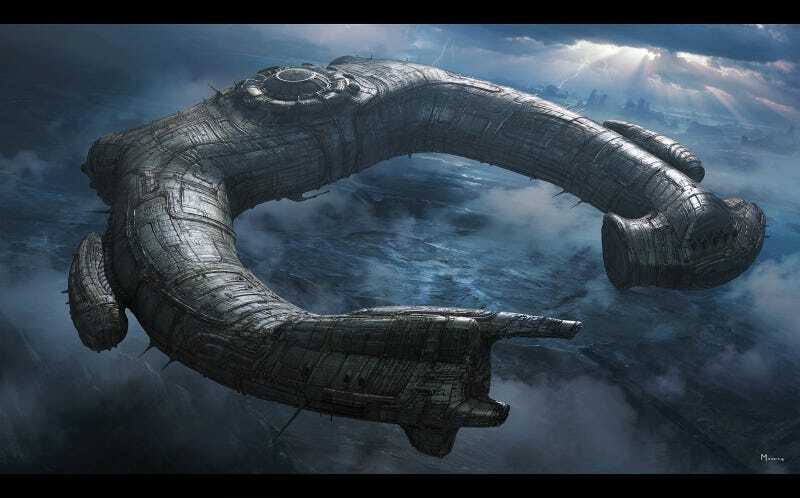 Another sign is this giant crashed ship (which the movie had already shared a still of), which bears not a small resemblance to the ring-shaped ship from Prometheus. We even saw a map of one displayed as a hologram in that movie. “What happened here?” comes the voiceover. The team seems to explore the ship, and Daniels walks down a corridor that, again, was part of earlier promotion for Covenant. It’s almost identical to what was found in Prometheus and Daniels even finds a clue. It’s a Weyland-Yutani branded dog tag, which means that either the Covenant crew got unlucky enough to stumble onto the same planet as in Prometheus; they’ve found where Elizabeth Shaw (Noomi Rapace) and David’s head (Michael Fassbender) ended up in their subsequent journeys; or the ship from the other planet has, somehow, been repaired and flown from that planet to this one. The other option is that this is cut to make it look like Daniels finds the dog tag where the corridors are, but she’s actually somewhere else entirely. Billy Crudup finds a room full of eggs, which we have seen before and know are bad news. It’s slightly updated, but this is fairly close to the classic H.R. Giger egg design. The moving inside tells us that there’s about to be a big old face hug. This happens really fast in the trailer, so I’ve slowed it down so you can see just how much this one resembles the original design. First is this shot of an abandoned headset with someone calling, “Do you read me, come in,” which I think is from the sequence where Faris, on the landing shuttle, has to fight off a Xenomorph that has a) just burst out of the back of a crew member and b) killed another crew member. Next is a shot of Daniels—crying, panting, and carrying a weapon—back on the Covenant. That’s Tennessee behind her, and he doesn’t go down to the planet, so they have to be back on the Covenant by this point. This part is back on the shuttle, with the backburster breaking through the glass where Faris has tried to lock in the medical bay. And this part actually comes first, since Carmen Ejogo bringing someone infected to the shuttle is what kickstarts all the action there. In rapid succession we have Faris briefing the Covenant on the goings-on, a Xenomorph about to burst out the back of someone, and Carmen Ejogo pointing a knife while stuck in the room with that Xenomorph-infected friend. That’s going to end poorly. (These are all shots that were in the first trailer). A ship appears to be making a break from the planet during a storm, but I actually think this is a landing because of a) the angle and b) the fact that we see the shuttle explode. I guess this could be another one landing to bring help. This is sort of cut to imply that Tennessee yelling at Faris to “Calm down, sweetie” is from this scene. (The endearment is a reminder that they’re married.) Her response is “Don’t tell me to calm down, you didn’t see,” which is probably a reference to what happened on the shuttle with the Xenomorph. A Xenomorph that looks a bit like a chestburster, but lighter in color and with spines down its back, attacks someone on the planet. The flames behind this scene seem to indicate that it’s right after the shuttle explodes. Like it does later in the trailer, see? These things also happen before the fire-lit attack. Again, the cut implies that Faris trying to shoot a Xenomorph is what sets off the explosion. The body with the wedding ring is, I’m pretty sure, the person that the burster incubated in before tackling the guy with the gun earlier in the trailer. I have no idea who this mysterious gun-wielder is. It looks like the fire from the shuttle has lit this shot and that the hooded person has saved them, maybe? It is kind of a classic “just saved you” entrance pose. I’m betting it’s either Noomi Rapace—which is unlikely since her role is so small as to be a cameo—or David, the other “synthetic” that Michael Fassbender is playing and the one we last saw as only a head in Prometheus. He’s supposedly the only survivor on this planet, and I’m betting he’s behind the hood. Remember how Prometheus started with a flashback to the Engineers/Pilots (the big, bald, white aliens—they’re called both, with “Engineers” being prominent in Prometheus)? This, with the monumental figures we’ve seen them make before, seems to be another one of those. No, Facehugger, hug faces, not guns. It looks like one of the holds on the Covenant is depressurizing. Also a good time to remember that the Covenant is full of the things people would need to start a colony, so obviously there are vehicles and heavy machinery on board. Daniels and Tennessee work together to try to save the Covenant, note that in the upper left is a monitor with either David or Walter on it. It looks like he’s at the controls of the ship. “Where is it?” growls out Daniels. From the way we keep seeing doors shut and lock, it seems like either they’re trying to isolate the Queen and to kill it or the ship’s working against them and trapping them with it, and they’re racing the doors. I think it’s the former. And this is the money shot. After the title card, we see how Daniels gets off the planet when the shuttle explodes: Tennessee in another ship—much flatter than anyone we’ve seen before, so it isn’t the one in the storm—clearly came down to help. And Daniels is outside the ship with a gun trying to rid them of a pest. Just a slight problem they’re facing. Sorry, I was wrong before. This is the money shot. From everything we’ve seen, it sounds like the planet the Convenant gets to is, like the one in Prometheus, a place where the Engineers and the Xenomorphs pretty thoroughly blighted. It also looks like the information Shaw and David got away with in that movie led them there, where Shaw probably perished, leaving David all alone to meet the Covenant crew. The party sent to scout out the planet runs into trouble, including at least two infected crew members and a exploded shuttle. Tennessee and another ship come to get them, they fight their way back to the Covenant, and there they have to get fight off one or more hitchhikers. Incidentally, the quote shown in the this trailer, “The path to paradise begins in hell,” is supposedly a quote from Dante Alighieri (not that I can find a citation for that to save my life. I suspect it’s one of the quotes attributed to him but never said. If you can prove its provenance, please let me know.) That draws a line from the old name of this movie, Paradise Lost, which is a title from a different epic poet with an obsession with heaven and hell.